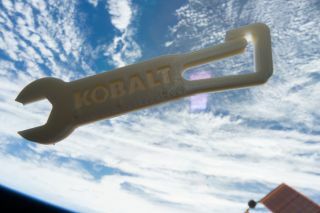 The Additive Manufacturing Facility, a commercial 3D printer aboard the International Space Station, printed this wrench (its first tool) in June 2016. Do you have a creative idea for a tool that astronauts could use aboard the International Space Station (ISS)? A new competition, called the ISS Design Challenge, is asking college students for creative designs for tools that space station astronauts could use in their everyday lives aboard the orbiting lab. The winning tool design will be 3D printed aboard the space station using a Made In Space printer. The competition, which is sponsored by Mouser Electronics, will be judged by former ISS Cmdr. Chris Hadfield and former "MythBusters" co-host Grant Imahara. Daily life aboard the International Space Station can be challenging; many of the ordinary tasks we take for granted here on Earth require the creative use of tools and contraptions in the weightless environment of space. And sometimes, it's just easier to create the tools in space than to launch them to the space station. Graphic outlining the operation of the 3D printer aboard the International Space Station. "Life on a spaceship — it's different because you're weightless," Hadfield said in a video overview of the new competition. "Everything that you're so used to just putting down somewhere — drinking a glass, putting it down, the water staying in the bottom. Your hair staying down. Your shirt being on the lower part of your body and not floating up around your head." Indeed, engineers have to get creative — and that's where the student competition comes in. "Life in space isn't easy," Imahara said in the video. "It's full of challenges that push the limits of technology, and often requires truly innovative solutions. That's where engineers come in, and if you have an idea that's creative enough, that could be where you come in." The winning entry must meet strict safety guidelines to be accepted into orbit. For example, it cannot require any external power and cannot use an open flame, and it must use specific polymers (materials) for 3D printing. Early entries on the Mouser website include a space drone, a virtual-reality headset for astronauts to look at pictures of loved ones, and an astronaut finger wrench. "This contest definitely kicks up the excitement level by challenging our customers to create something to be used in space," Glenn Smith, president and CEO of Mouser Electronics, said in a statement. Other partners in the project include the Institute of Electrical and Electronics Engineers, Hackster and MacroFab. The winner will receive a 3D printer, a consultation with Made In Space and, of course, the opportunity to see his or her technology used on the ISS. Entries are due Oct. 7. Full contest details are available here.